According to the earliest Buddhist scriptures, the Buddha taught there are four stages to enlightenment. These are (in Sanskrit) srotapanna, or "stream enterer"; sakrdagamin, or "once returner"; anagamin, or "non-returner"; and arhat, "worthy one." Read More: What Is Enlightenment, and How Do You Know If You've "Got" It? This fourfold path to enlightenment is still taught in Theravada Buddhism, and I believe it may be taught in some schools of Tibetan Buddhism, also. The rest of Mahayana Buddhism has, for the most part, worked out a different formula for the stages of enlightenment. However, the designation "stream-enterer" occasionally turns up in Mahayana texts, also. The classic definition of the stream-enterer is "one who has entered the supramundane path." Supramundane is a fancy word for "transcending worldliness." The Sanskrit is arya-marga, which just means "noble path." The qualifications for srotapanna (sotapanna in Pali) seem pretty fuzzy. However, in early Buddhism achieving the status of srotapanna was necessary to be considered part of the sangha. So let's see if we can clarify what it is to enter the stream. Some teachers say one enters the stream at the the opening of the dharma eye. Dharma is a word that can refer to the teachings of the Buddha and also to the true nature of reality. Read More: What Is Dharma in Buddhism? The dharma eyes sees that there is more to "reality" than the appearance of phenomena. The Buddha taught that appearance is illusion, and when the dharma eye opens we begin to appreciate the truth of this for ourselves. We may not have perfect clarity, but we do appreciate that the way reality ordinarily is understand is very limited and, well, not all there is to reality. In particular, we begin to perceive the truth of Dependent Origination and the way all phenomena depend on other phenomena for existence. Another standard definition of srotapanna found on the Pali Sutta-pitaka is that one enters the stream by cutting away the first three fetters. "Fetters" in Buddhism refer to perspectives, beliefs and attitudes that bind us to ignorance and block awakening. There are several lists of fetters that do not completely agree, but most of the time the first three are: (1) belief in a self; (2) doubt, especially in the Buddha's teachings; and (3) attachment to rituals and rites. If Buddhism is new to you, "belief in a self" may seem nonsensical. But the Buddha taught that our belief that "I" am a permanent entity separate from everything else is the chief source of our unhappiness. The three poisons -- ignorance, greed and hate -- arise from this false belief. Doubt in this sense is distrust of the Buddha's teaching, particularly in the truth of the Four Noble Truths. However, doubt in the sense of being uncertain of what the teachings mean is not a bad thing, if that doubt drives us toward achieving clarity. Attachment to rituals and rites is an interesting fetter. Like doubt, rituals and rites are not necessarily "bad"; it depends on what one does with rituals and rites and how one understands them. For example, if you engage in a ritual because you think it will wipe away harmful karma, or bring you good luck, you are mistaken. But rituals can play a beneficial role in practice. Read More: The Purpose of Rituals in Buddhism. 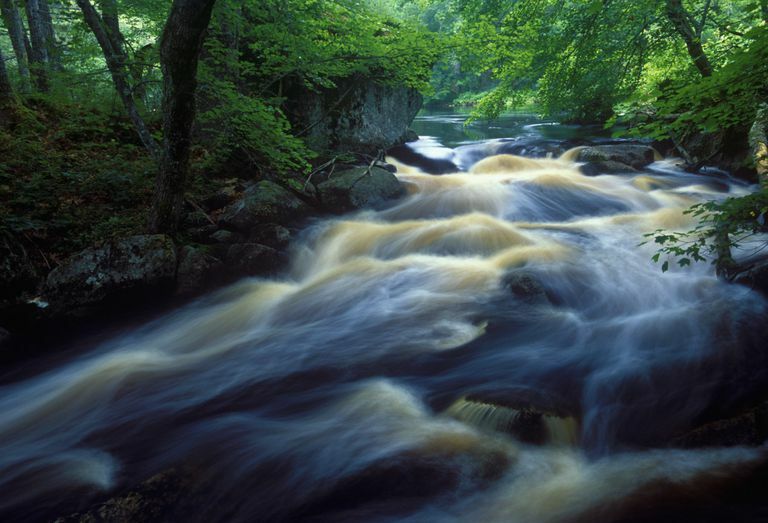 The characteristic of a stream is to flow. Anything that enters the stream will be pulled along with the flow. Likewise, a characteristic of srotapanna is to keep flowing to enlightenment. Entering the stream marks a point in spiritual development where completely abandoning the path is no longer possible. It is said that a person who has achieved srotapanna will realize enlightenment within seven lifetimes. Not everyone believes that literally. The important point is that once srotapanna is achieved, there's no going back. The path may take unexpected turns; the seeker might yet run into a lot of barriers. But the pull of the stream will become stronger and stronger.